It's not the first time I eat something in a restaurant and instantly think "how can I recreate this at home?". In fact, this happens to me most of the time if I'm having something that is really nice, but at least seemingly easy to make at home. I had one of these moments after having the Burnt Orange Cafe's walnut bread with avocado, and I couldn't wait to try making my version of it. In Finland I used to bake my own bread all the time. Somehow the flour there was easier (for me) to work with, there was more flour varieties available, and I always had fresh yeast to use for making bread rolls or other bread at home. After moving to Australia I not only mostly stopped eating bread (because I couldn't quite find rye bread I was happy with), but I also stopped baking it. During the years of living here I've of course baked bread many times, but never in the same scale as in Finland where I used to bake bread almost every week. Nowadays I mostly make loaves, sweet or savoury, and in my opinion they really are the easiest and quickest way to enjoy freshly baked goodies at home. Preheat oven to 180C and prepare a standard size loaf tin. In a medium bowl, sift together the flours, baking powder, bicarbonate of soda and salt. Beat the eggs in another bowl and beat in the yoghurt, avocado and oil. Fold the dry ingredients into the egg mixture, add the walnuts and fold to combine. Bake for 45 minutes or until a skewer inserted in the middle comes out clean. Yes, yes! When I saw the photo, I thought this bread looks really really familiar! LOL. Big kudos to you - you can consider to supply this to Burnt Orange! This sounds like an absolutely wonderful quickbread! I love the creamy flavor of avocado...how delicious. 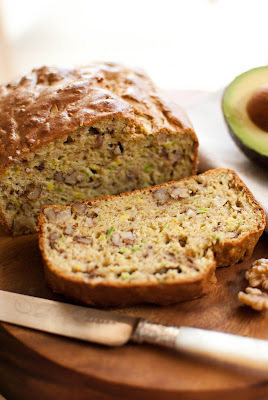 I love using fruit and vegetable purees in baked goods, but have not yet tried avocados... what a great idea! This bread sounds fantastic. your creations are so beautiful.. this bread looks very yummy! I love this post Maria. The bread was the highlight of burnt orange for me! Check out my blog I passed on a blow award!! The bread sounds really fantastic! 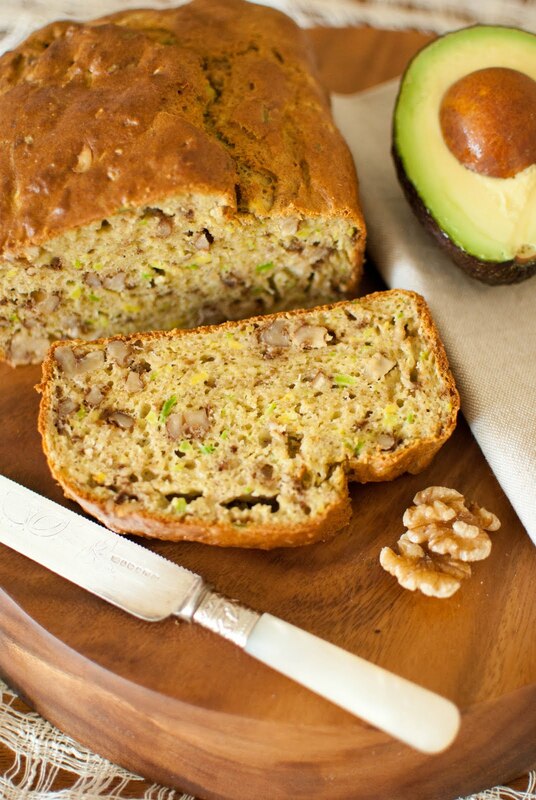 So delicious and healthy...and full of omega-3s with the walnuts and avocado! This loaf looks deliciously moorish!! would be wonderful melted with a slather of butter!! yum!! Wow, Avocado in bread, is really interesting and healthy recipe, Maria. I was just thinking today how Avocado is not a very versatile fruit - what do you do with it besides put it in salads or sandwiches? Looks like i have been proved wrong - I will have to try this! You Finns and your rye bread! Panu whines about that too! Hahah :) walnut and avocado sounds amazing. I had walnut and treacle bread on the weekend and fell in love with that, probably because it was sweet! Oh wow avocados and walnuts sound delicious together! I like the avocado in the bread idea! And I definitely wouldn't have been able to figure out a recipe like that without help - it looks delicious! It has never occurred to me to put avocado in bread, but this looks WONDERFUL, especially paired with the walnuts! What a wonderful bread! Hey Maria! This loaf is beautiful! I love how the outside looks kind of shiny almost. Very pretty. Oh, and it sounds so wonderful too with the avocado and nuts. Yum! What a creative use of avocado. The slight green tinge of the bread is lovely and it looks quite moist (almost cake like?). 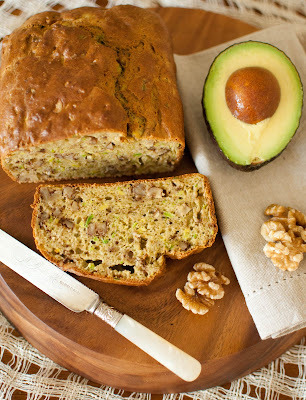 I am a huge sucker for anything with avocado, I can't wait to make this bread, thanks so much. I saw you were the Foodista blog of the day...your recipes look so good! 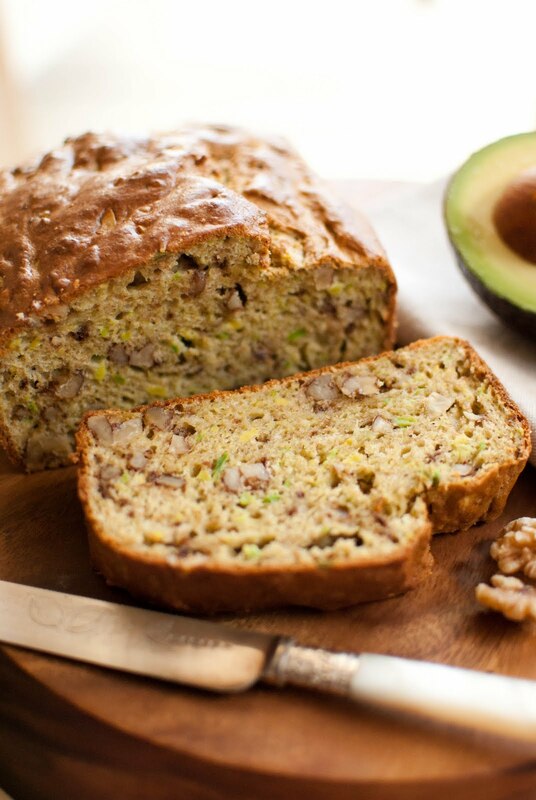 Love the avocado idea for the bread! Is this a sweet bread or a savory one? does anyone know the caloric intake on this bread per serving? I just tried this and it did come out a little too moist (still wet-looking though my knife came out 'dry'), is that normal? It doesn't look that dry like on your pictures. No idea what I did wrong (used fat yoghurt though instead of fat-free). And it tastes rather bitter: I heard that if you warm up/heat an avocado it turns bitter, though I never thought much more about it. It just looked soooo good and imaginary yummie... Did you taste a hint of bitterness too?